England manager Roy Hodgson insists he has no concerns over striker Wayne Rooney's fitness and attitude. Rooney, out for a month with a thigh injury, has revealed he reported back for Manchester United's 2009 pre-season training seven pounds overweight. The revelations come after his fitness was questioned when he performed poorly in England's Euro 2012 campaign. "I'm hoping the next time I meet him he'll be fit and playing at the top of his game," said Hodgson. "He's a top striker and someone I want in the squad I select from," he added, ahead of his team's opening World Cup qualifier in Moldova on Friday. "I don't have any concerns." Rooney, 26, missed England's opening two Euro 2012 games against France and Sweden through suspension. Even though he scored the winner against Ukraine, he struggled for form as Hodgson's side went out to Italy on penalties in the quarter-final. Hodgson insisted Rooney's preparation and fitness, which the player admits in a new autobiography was below peak condition three years ago, was "a club matter". "I'd dispute the fact that he wasn't fit in the Euros," said Hodgson. "He might not have been played at his best level, perhaps, and might not have had a lot of match fitness because he'd not had a chance to play matches before, but it wasn't a fitness issue. "What he does in pre-season and with Manchester United is a matter for Sir Alex Ferguson and the club. I hope to see him back in the United team fit and playing well so I can welcome him back into the England squad." Hodgson sympathised with Rooney's struggles during the tournament in Poland and Ukraine, saying: "I thought from a personal point of view, during the time we were together, Wayne Rooney worked very hard and was more than focused on the task. "He was very frustrated over the first couple of games that he couldn't be picked despite training hard. He was desperate to do well in the first game he played. "We're talking about a star. When a star maybe doesn't reach the level expected of him criticism follows - but I have no criticism of him or his fitness." Rooney's decision to take a break in Las Vegas between the end of last season and the start of Euro 2012 also came under scrutiny following England's exit. Hodgson refused to be drawn into criticism, saying: "I don't comment on what players do in the time they are given off after a season. It's a long season. They're under pressure. They're free to decide how they spend their free time. "Wayne's current injury is a major setback but he's come back from them before. "I have no reason to believe he won't come back fit and strong and anxious to prove his critics wrong." Meanwhile, Rooney admits in his new book, 'My Decade in the Premier League', that handing a transfer request to United in 2010 was the "biggest mistake" of his career. And in an interview with Football Focus, to be shown on Saturday, Rooney told presenter Dan Walker: "I'd put the statement out and, almost immediately, I realised I made a mistake. "I rang (United chief executive) David Gill and said: 'Look, I feel like I've made a mistake and it was silly of me to say what I said. Hopefully we can work it out and work together in the future'. "Thankfully they agreed. They were great and they brought me back into the team quickly. They were fantastic to me for that. Hopefully I have and can keep repaying them with goals." Rooney says he has not spoken to Ferguson about the issue since and insists he will remain at Old Trafford for "as long as I am wanted". 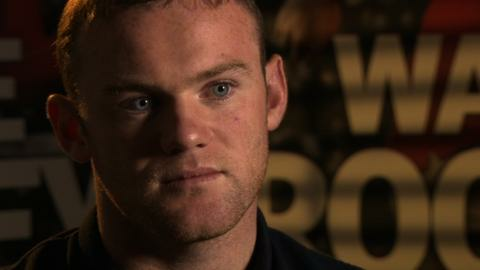 You can hear more from Rooney when he is interviewed in Saturday's Football Focus programme on BBC One from 12:15 BST.